The Our Lady of Hungary Youth Group and the OLH Legion of Mary held a balloon rosary walk for peace on September 11, 2016 in remembrance of the 15th anniversary of the 9/11 attacks. 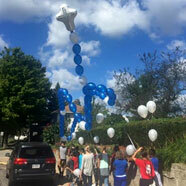 A big gracias to Karen Carrizosa and her Mom for assembling the balloon rosary! Thank you to all who supported what we hope to be a beautiful annual event!